Make your car stand out from the crowd! Become part of #TeamPumaspeed with this fantastic looking full car wrap as seen on our Demo Fiestas and Focus RS! We can now offer this wrap fully supplied and professionally fitted at our wrap supplier in Barnsley, South Yorkshire for an incredible price, if you would prefer to have the wrap supplied, or fitted at your home get in touch for a quote. 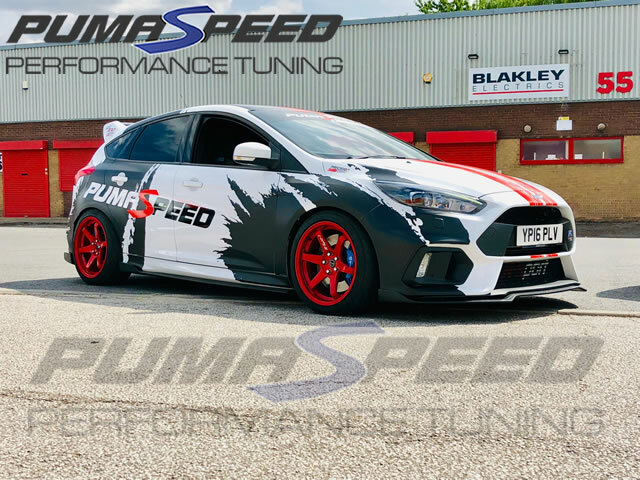 We've worked closely with our supplier to create this awesome look inspired by our Grey X-47R powered track car, which can be applied to both Fiesta Mk7, Fiesta Mk8 and Focus Mk3. If you wish to apply this wrap to a car not listed here please get in touch. This high quality vinyl wrap is both durable through all weather conditions and will not degrade over time like some lower quality materials available on the market. Currently available in black and red vinyl as seen on our demo cars, looks fantasic on any colour car! Pumaspeed have a specialist distribution team that can dispatch the Pumaspeed Full Car Wrap to any destination worldwide.